You chose patients as your primary focus. We chose billing and coding as our primary focus. Let us navigate the complicated, time consuming billing and collection issues and allow you to focus on your practice. We will process and validate your procedures and receipts to the penny, while legitimately maximizing the revenue you have earned. Data is at the heart of the RCM process. We start by working directly with your hospitals and facilities to ensure we receive your finalized reports and billing information on each patient. Our HealthPro coding team has extensive experience, training, and knowledge. Every coder is certified and ALL are in the United States. Each team member is required to complete nationally recognized continuing education programs, in addition to our internal training. Our certification associations are AAPC, RCCB, AHIMA and ARRT. Our coding team identifies dictation opportunities and provides feedback to physicians for industry dictation best practices allowing for legitimately maximized revenue. Each day your payments from payors and patients are processed and posted by line item to patient accounts. Reconciliations occur daily, weekly and monthly to ensure every penny is captured and balanced. 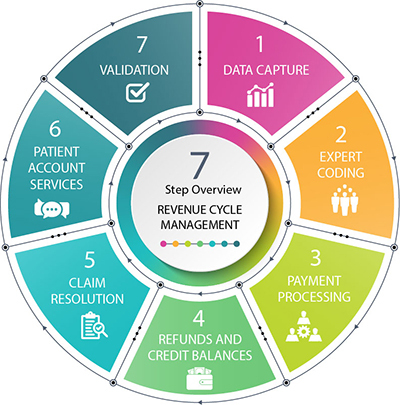 With the mandate by CMS that patient overpayments need to be returned within 60 days, we diligently process refunds and credit balances timely to ensure compliance. We work directly with payors and patients to promptly resolve credit balances. There are three distinct areas in our claim resolution process – Denials, Ignored Claims and Accounts Receivable. Each area is critical to the full circle of follow-up. Denials are tracked, monitored and evaluated to identify trends and resolutions. Each denial is reviewed by a Subject Matter Expert. The denial is carefully scrutinized with thorough research to determine the validity of the denial and appeals are submitted. Ignored Claims still occur; Our team tenaciously follows up on each one until the claim is processed by the payor. Accounts Receivable are all other open claims that have not been paid. Each patient account is reviewed monthly to ensure every step in the process has occurred and payment is expected. Our in-house call center team is specifically trained to help your patients by answering their questions and assist them with the details to pay for the services you have provided. Every patient is treated with dignity, empathy and respect. Charge and payment validations are critical to ensuring every report you dictated is billed and each corresponding payment was accurate according to your payor contract. Our internal controls and unique verification processes allow for identifying issues, deviations in patterns and irregularities early in the cycle optimizing the time for resolution.